Skiploom in game: 565 Who? Important notice! Pokemon Skiploom is a fictional character of humans. Skiploom debuted in The Grass Route under the ownership of Ephraim where it battled against Ash's Bulbasaur in the Grass Tournament finals. A Skiploom appeared in Pursuing a Lofty Goal! belonging to Steveland, a participant of the PokéRinger competition. A Skiploom appeared alongside a Bellossom belonging to Haruno in Turning Over A New Bayleef. Multiple Skiploom were among the feuding Pokémon at Professor Oak's Laboratory in Bulbasaur... the Ambassador!. A Skiploom appeared in A Tyrogue Full of Trouble where it received an apple from a Tyrogue. Several Skiploom were among the inhabitants of the Dragon Holy Land in Fangs for Nothin'. 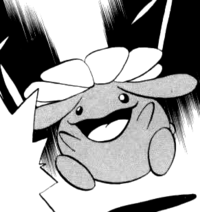 A Skiploom made a brief appearance in Camp Pikachu. A Skiploom was used by one of the students of the Pokémon Trainer's School in Gonna Rule The School!. Skiploom had a cameo appearance in Grass Hysteria!. Several Skiploom were among the Pokémon seen at Professor Oak's Laboratory in Showdown at the Oak Corral and Journey to the Starting Line!. A Skiploom was used by a Trainer for the PokéRinger contest in That's Just Swellow. Multiple Skiploom appeared in the opening of Destiny Deoxys. Skiploom were used in the Hoenn Grand Festival in Hi Ho Silver Wind! and the Wisteria Town Pokémon Contest in Harley Rides Again. Multiple Skiploom made a brief appearance in Coming Full-Festival Circle!. A Skiploom made a very brief appearance in League Unleashed!. Multiple Skiploom appeared in Zoroark: Master of Illusions. Zorua even turns into one in order to float safely to the ground after escaping Grings Kodai's plane. A Skiploom appeared in A Full-Strength Battle Surprise!. EP178 Skiploom Ash's Pokédex Skiploom, the evolved form of Hoppip. 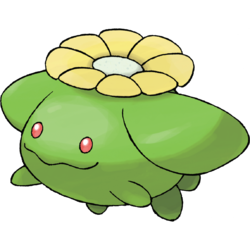 This happy-go-lucky Grass-type has a flower on its head which opens and closes depending on the temperature. 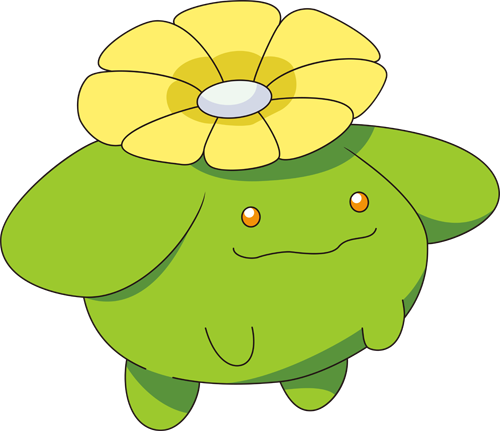 In Bringing up Bellossom, Erika is seen with a Skiploom. She uses it to fight Pryce and his Swinub in the opening ceremony of the Indigo League, but falls easily due to the type disadvantage and the old man's incredible skill.